Join us for happy hour at the Museum! MCASB is offering $5 signature cocktails created by Outpost at the Goodland‘s resident mixologist, Chris Burmeister. FREE themed art activities, treats from Whole Foods Santa Barbara, and a special set from KCRW DJ Travis Holcombe. Event is presented in partnership with KCRW. Beer provided by Telegraph Brewing Company. FREE tours of the current exhibitions: Then they form us and Bloom Projects: Yara El-Sherbini, Border Control. 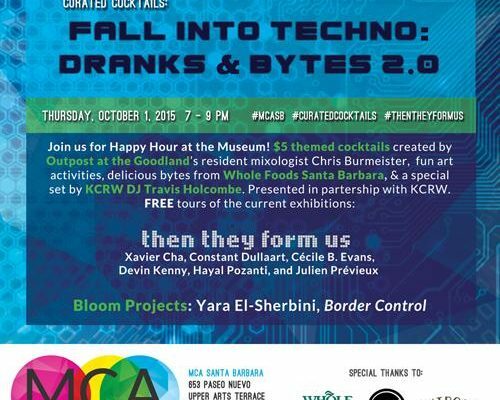 Register for Event: Curated Cocktails: Fall Into Techno – Dranks & Bytes 2.0 with KCRW! Your ticket for the: Curated Cocktails: Fall Into Techno – Dranks & Bytes 2.0 with KCRW!